Nearly 60% of respondents to this month’s Real Issues. survey said they have trouble attracting younger workers to their companies. What’s a dealer to do when several key, long-term associates are nearing retirement, and young pros aren’t exactly lined up to take their place? That challenge, suggested by two readers for our most recent survey, has no easy answers. In fact, judging from the results of our monthly Real Issues surveys, attracting, hiring and retaining young pros is one of the toughest issues facing our industry today. While frustration is evident in several answers— “Sell the business before it’s too late,” and “Lower your standards and quit drug testing”—many others shared practical insights that can help you face this challenge head-on. In one form or another, the problem of attracting, hiring and retaining young pros is consistently the most commonly shared challenge to our Real Issues surveys. 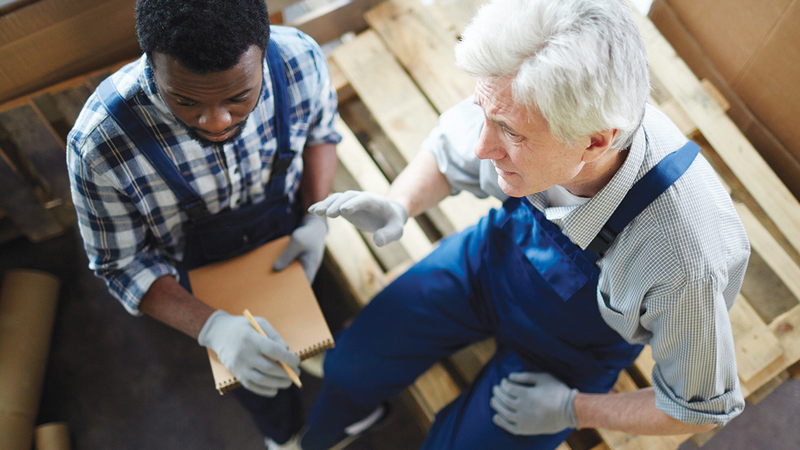 For this month’s Real Issues feature, we combined what two readers shared—difficulties attracting and hiring young people with the problem of experienced team members retiring. Both readers who submitted this challenge will receive LBM Journal Prize Packs (polo shirt, mug, cap, pen and more). As we do each month, we built a very brief survey around that question and sent it to the subscribers who’ve opted in to receive email communications from us. A big thank you to the 200-plus readers who took time to share their insights and experiences. If you’d like to participate in future Real Issues surveys, drop me a note at Rick@LBMJournal.com, and we’ll get you added to our opt-in list. 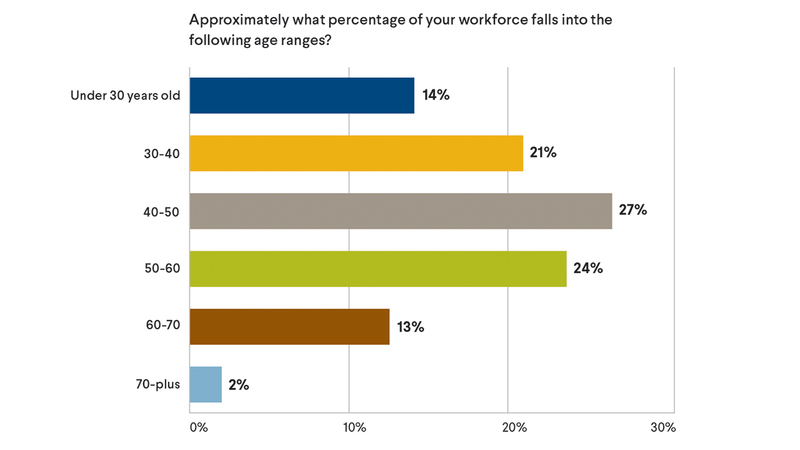 First, we wanted to get a feel for how the age breakout of team members applied to the respondent companies, so we asked: “Approximately what percentage of your workforce falls into the following age ranges?” As the chart shows, the majority of employees at the respondent companies (51%) are between 40 and 60. Among respondents to this survey, the percentage of employees under 30 (14%) is almost identical to the number of employees over 60 (15%). Next, we wanted to gauge how many respondent companies are struggling with this problem, so we asked, “In general, does your company struggle to attract younger workers?” While exactly 1/3 of respondents said no, nearly six out of 10 (58%) said yes. This confirms the anecdotal evidence that most LBM dealers are having a tough time attracting younger workers. “1. You have to advertise your business. It seems like a no-brainer, but you have to go to the talent, not wait for the talent to come to you. 2. Always be on the lookout. If you are out to eat on the weekend and have a great, hardworking, personable waiter, extend a business card and ask if they might be interested in a career and set up a meeting. “You have to make a value proposition to potential hires. This industry gets a bad rap, sometimes deservedly so, for being very conservative, not tech-savvy, with limited advancement opportunities, especially at small companies, and working conditions that are not appealing to all types. This is, however, an industry where you can make a very good living if you are ambitious, willing to learn, and have a solid work ethic and healthy set of values. “1. You will have to adapt. Learn what they’re looking for in perks, benefits, career paths, etc. Start thinking about what you might have to change. 2. If you are not already, start using social media at work. Today’s work force is online daily. Do you want to reach them? Get out there. Hundreds of readers share their insights for this every-issue feature. Have a Real Issue? Contact Rick@LBMJournal.com. The readers who suggested this Real Issues topic will receive an LBM Journal prize pack including a polo shirt, cap, mug, pen, and more.